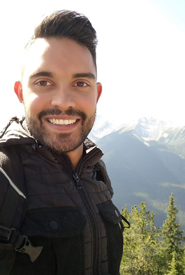 Earlier this summer, my friends and I took a day trip to Elora, Ontario, to visit the Elora Quarry and Elora Gorge conservation areas. 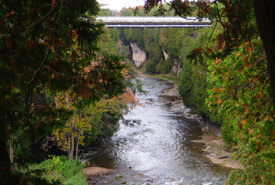 Elora is a small town near Guelph, about a 90-minute drive west of Toronto. The drive there was very scenic, with gorgeous views of the Niagara Escarpment. We first stopped at the Elora Quarry, which is known for its two-acre (0.8-hectare) limestone quarry. After parking our vehicle, we took a short hike through a forested area to the beach, which consisted of soft, light brown sand and quarry views on one side and the Grand River on the other. 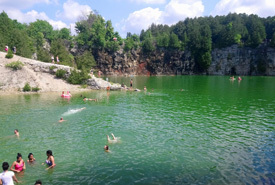 The quarry is filled with sparkling, emerald-green water and surrounded by 12-metre high cliffs. We quickly grabbed a spot on the beach, laid out our towels and put on some sunscreen. There was a heat warning in effect that day, so it wasn’t long before we needed to cool off. We felt instant relief when we immersed ourselves in the refreshing water. As we swam around, we saw people relaxing on inflatable unicorns, flamingoes and popsicles. Some brave souls even hiked up the cliffs and jumped into the water. We almost followed suit, but chickened out just before jumping off. We also discovered a small cavern inside one of the cliffs and explored it. Inside was a small waterfall and pools of cool water. We swam to the opposite end of the lake and sat on the bottom part of a cliff, where we noticed some frogs. One of them hopped into the water, quickly becoming the snack for a fish lurking below. Though somewhat sad, it was an interesting sight to witness. After a few hours of relaxing on the beach and swimming in the lake, we headed to the Elora Gorge. 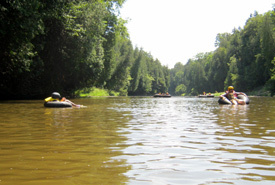 We rented inner tubes, helmets and lifejackets to go tubing along the Grand River, an activity none of us had ever tried before. At the tube launch area, we eagerly got on our inner tubes and entered the sparkling river, which flowed past towering cliffs covered in plant life. The river flowed noticeably faster in some parts. Tubing through the slower-flowing areas was relaxing, which gave us a chance to take in our stunning surroundings. We saw some interesting wildlife, including a hawk, turkey vulture and what I think might have been a belted kingfisher. The rapids, on the other hand, were exhilarating, not to mention scary, at times. At one point, the current pushed my tube into a rock, causing me to fall off and smack my elbow against another rock. The current was so strong that I had no choice but to just go with the flow, so to speak, and wait until I reached a calmer area before attempting to get back on my inner tube. Fortunately, the incident just left me with a bruise and a scrape, and I would definitely go river tubing again. After a fun-filled afternoon, we went to downtown Elora and ate a satisfying meal on a restaurant patio. Then, we made our way back to Toronto. I thoroughly appreciated this brief, much-needed break from the city. 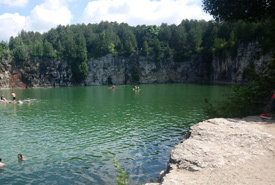 To anyone looking to get away next summer, even for just a few hours, I highly recommend making a trip to the Elora Quarry and Elora Gorge.